Do you remember a post I did last December about the Princess Theater in Old Strathcona? The same night we saw ‘Hitchcock’ there, we hung around Old Strathcona to surf some of the cute little shops. All of a sudden, GASP! I spotted the ‘Holy Grail’ of a Boomdee Christmas. I couldn’t believe my luck and immediately hit up Mr B with the biggest, needy, brown Boomdee eyes he’s ever seen, hehe. There, in a little shop window was an Aqua Christmas Tree ! Can you imagine me going home without something so Aqualicious? Neither could I. Bonus, because it’s tall and narrow, it barely takes up any space in the Boomdeeadda office. It’s set on an inverted wicker basket draped with a vintage table-cloth I got while shopping with sweet Alys in San Jose. If you haven’t met her yet, Alys is my Bestie in sunny California. Hurry on over to Gardening Nirvana where wonderful things happen every day 😀 Now, I wasn’t entirely sure what I was going to do with my new treasure. Clearly, the giant pink roses and aqua leaves were totally calling to me. I’ve scoured the Antique Malls for ornaments, all vintage naturally. The hunt for the perfect prize is always fun, I started off with a quest for stripes. 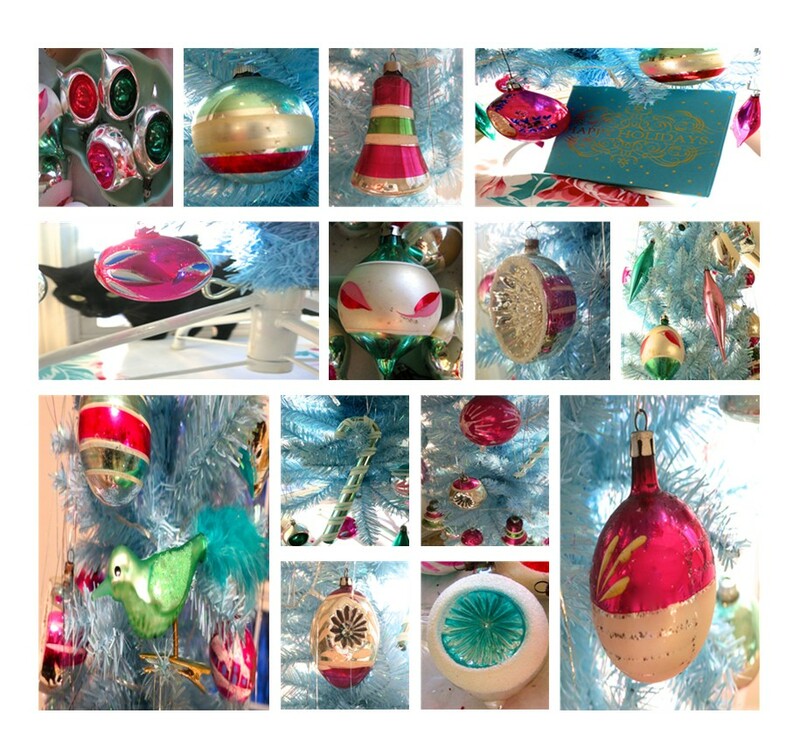 I added some pretty baubles that I’ve snapped up from various sources over the years. Honestly, I just love every single one of them. I can not pass up the pink, aqua, green and silver ones. They’re destined to come home with me and be loved forever. Sometimes, if you’re very lucky, you’ll find a whole collection still in the original box, like these gems. I bought these years ago, are they not a little slice of heaven? I recently spotted this charmer, a smaller version of a BIG dream, at a local gift shop. It’s a shiny vintage holiday trailer and I’ve wanted one forever! I don’t particularly like camping or ‘Glamping’ as it were. But I’d sure love to have a vintage beauty in the garden to use as a hideout or guest room, wouldn’t that be fan-boomdee-tastic? When all was hung with care and the tiny twinkle lights were ready to shine, the very last thing I added was the tree topper. It’s not vintage, but the next best thing. 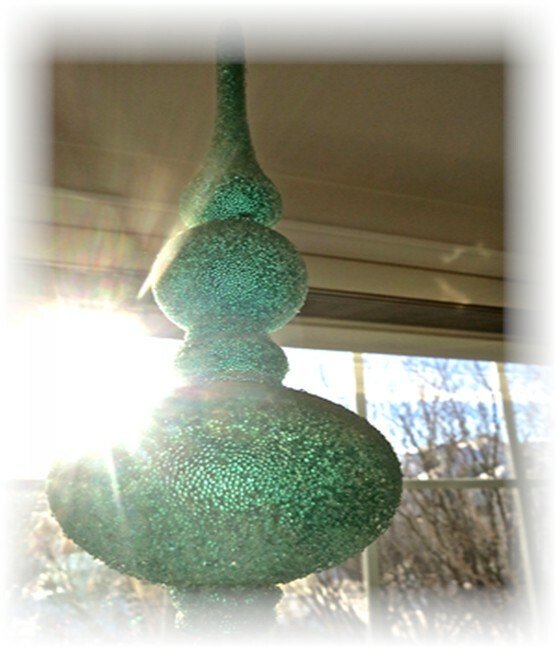 All sugar-coated with Christmas goodness, this sea-foam tree topper was brought home from a holiday in San Diego. Did you know there’s a Christmas store in almost every city? Just ask Mr B, he’s familiar with the best of them, LOL. As the bright winter sun disappeared, I stood back to marvelled at my sparkling little aqua tree and sighed, “yes, I think that’s just about perfect”. PS. I’ve taken one ornament off as a gift for a lucky follower of Boomdeeadda! All you have to do to qualify is leave Boomdee a message below. I’ll draw for a winner December 24th. messages and the time we’ve shared here all year long. I can’t wait to see what transpires, So exciting!!! 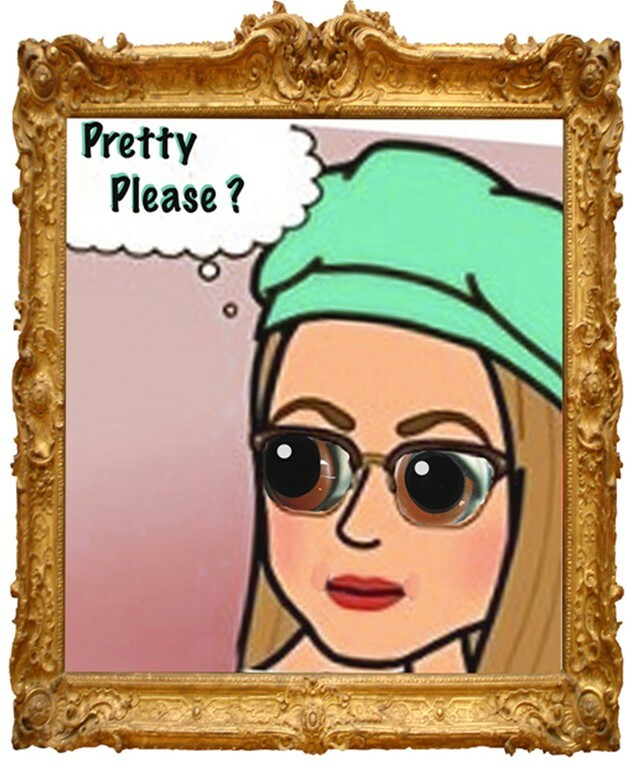 Thank you for the link to your fun, creative post Dani! Oh yes, Santa has already flown around New Zealand and probably in England now 😀 Did you have an amazing day or what? I think you might be right about local shops. Is it just me or is there more aqua out there than ever before? I almost bought more tea yesterday just because it was in a tiffany blue box…LOL. Then I was reminded I have umpteen teas already…..”just walk away from the Aqua tea box” my brain said 😀 Thank you for those Christmas hugs…..mmmmm felt real nice. Happy Boxing Day then, or do you have that at home? Oh seriously….the heavens above are with you to find such beauty for your home.Merry Christmas. That tree is simply aqua-licious! Thanks so much Phaery Gurl, it’s a bit of an addiction 😀 I just had to have it, you know how that goes sometimes. 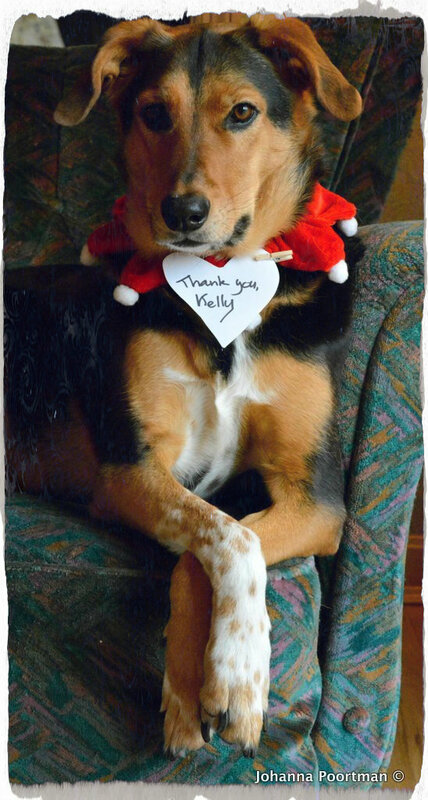 Have a wonderful Christmas with those you love most ! Anytime I see something aqua, I think of you Boomdee! 🙂 Happy New Year to you and yours! LOL, it’s kind of nice to have a colour as a trademark. It worked pretty well at Tiffany’s. HA. Thanks for your Cheer Phaery Gurl! Hope you have a wonder year too! 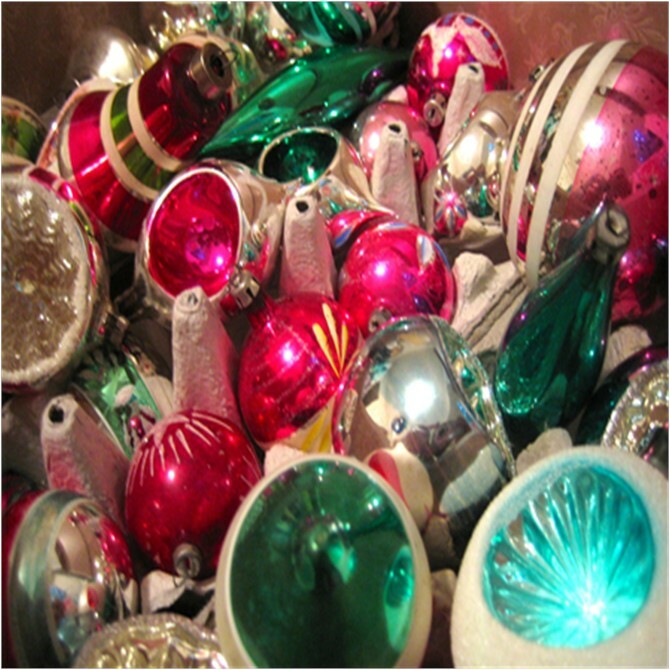 Oh those vintage ornaments remind me so much of my Grandmother … and I didn’t appreciate them then. I sure wish I had them now! I love that trailer, too. Awesome! 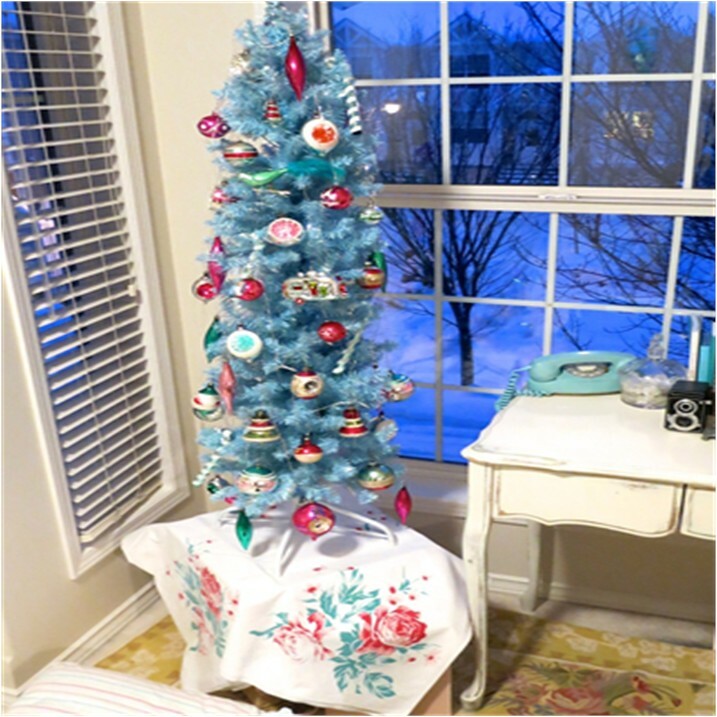 That Aqua Christmas Tree is truly Aqualicious!! This year, I was lucky to get a tree up! 🙂 Between reduced energy, limited time, and the Diva Donations party being pushed closer to Christmas due to weather, I was glad to get lights on the tree. It is pretty … but no ornaments this year, vintage or otherwise!! I’m having a minimalist Christmas in terms of decorations, but somehow it looks pretty still. Thank you and Happy Christmas! Good Luck in the draw. A very cheerful collection… love the trailer! Thanks Kerri, I’ll be tempted to leave it there long after Christmas. Isn’t that little trailer cute, I’m afraid it might well be the only one I’ll ever own..Darn Mr B with his sensibilities, LOL Happy Christmas! How fortunate are you to find an aqua tree? That’s wonderful – and it’s perfect that it’s tall and narrow, great for the space. Oh my! 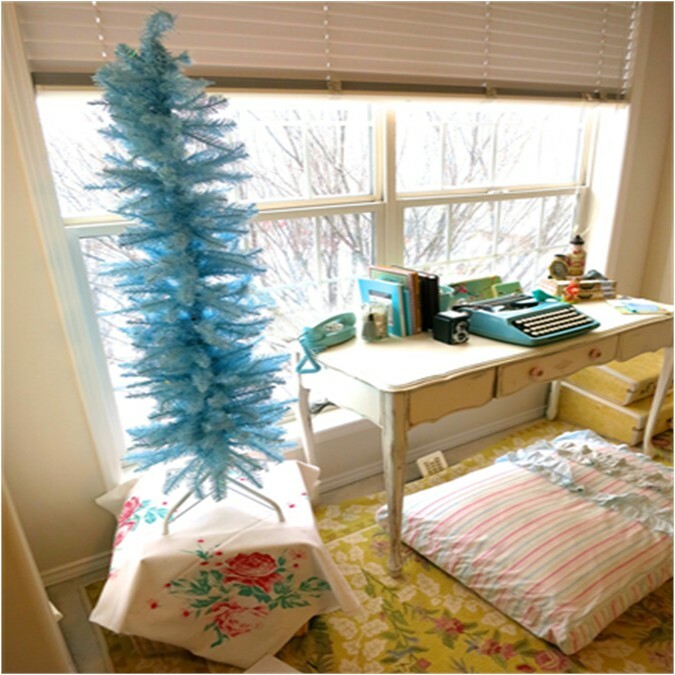 Lucky you finding an aqua tree and what fun you obviously had decorating it “a la Boomdee” !! It’s gorgeous…..the entire room is gorgeous……everything just screams “I’m Happy! !” and isn’t that what the holiday should be? Filled with “happy” ?? It’s fun to have a mission when we shop – yours obviously is keeping an eye out for aqua anything but you sure struck it rich here….and it makes for a VERY “Boomdeeadda Christmas” indeed! It really is my happy place and thank you so much for your compliment Pam. It’s a hodgepodge of wonderful things I pick up here and there. I guess it’s sort of like the collages I love doing so much. There’s not too much to bring unhappiness in my life, I’m lucky indeed. I remember the moment you picked up that tablecloth. We had so many wonderful times together. 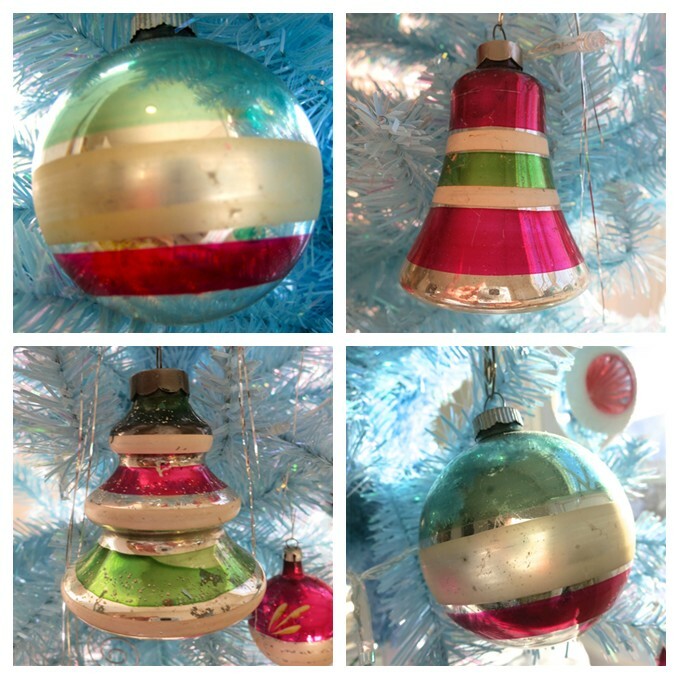 It’s a lovely reminder to see it under your aqualicious tree with your gorgeous baubles, Boomdee style. What a sweet post. Merry Christmas to you, too. I hope you’ve had a splendid day in your craft room. We took the boys to see Frozen this evening, then went and looked at some lights. Wishing you could have been along with us. Awwww, thank you ((( Alys ))) I would absolutely have loved to be part of your light tour. I think your neighbourhood has so much curb appeal, I can only imagine how beautiful it is all dresses up for the holidays. We like to go to our ‘Candy Cane Lane’ here, but it’s been so cold. We would indeed be a force to be reckoned with! Aw man, I would love to go on a shopping spree with the two of you! That would be so much fun! Sweet Alys is the worlds greatest hostess, you will never be bored and her cheerful, pleasant company is the best part of any excursion. Thank you so much for your nice message. They are hard to resist. I have another tree in our living room with ornaments collected from our many travels,received as gifts and inherited. I totally agree, it’s more fun to accumulate an eclectic collection over the years and relish in the stories than buy new, although I did make the exception for the vintage inspired camper. 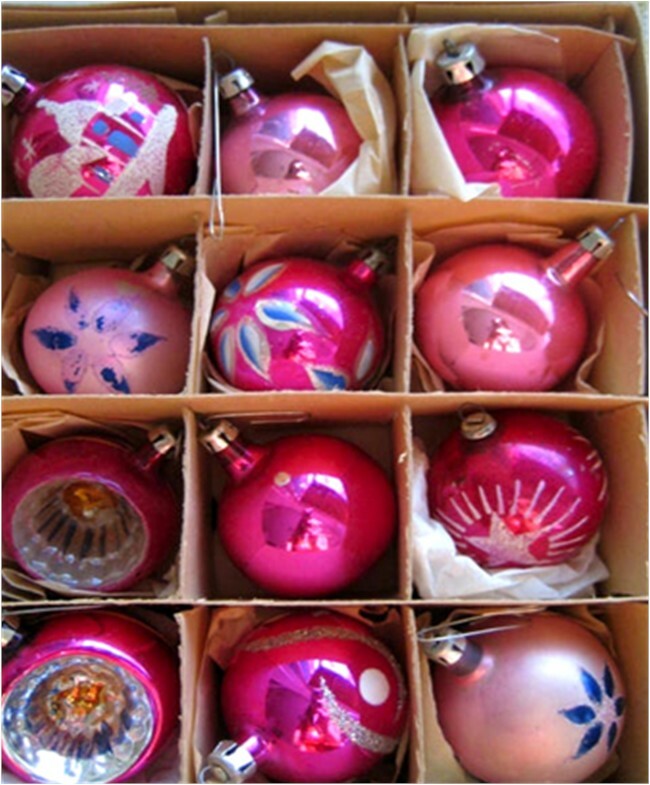 I bet you were tickled to find you 1930’s baubles, it’s nice they have a new home and will continue to be loved. Cheers and hope all your Christmas wishes come true! I love it! It was made just for you! The ornaments are so pretty and remind me of when I was young. Our neighbors upstairs in Brooklyn always had a huge Christmas tree and they didn’t decorate it until Christmas Eve. My sister and I got to go upstairs and take a candy cane off the tree and it was so exciting (we didn’t celebrate Christmas in my house). When we were getting ready to move to California, my parents made special arrangements for me to go upstairs on Christmas Eve and decorate it with them-my first time ever! I really love the motor home ornament the best-it is boomdee-fabulous!!! Love you and miss you bunches!!! Santa must have been watching you from the North Pole and put that aqua tree in your path. It looks stunning with all the vintage ornaments. It looks so Boomdee! 🙂 Merry, Merry Christmas. You’re such a treat, I can’t even fathom a ‘jaded blogger’. Thank you for all your sweet compliments. I’m enjoying the lights and glitter in the craft room so much. Isn’t ‘Oh My’ lovely! I’m a big fan of Matthew Mead too, his photographs are really eye candy for anyone who loves using vintage treasures.